I visited them around a decade (or a little more) ago, and at the time, it was a full house of wooly weaving and dying frenzy. Sadly, it seems to have slowed down a bit and the weavers now work on commission, though the shop still offers classes and workshops. And on Saturday, April 27th, they are having their annual Spring Harvest Festival with sheep shearing demos and other treats. I can only imagine if such a studio was plunked down in a heavy DIY urban area, they’d have to fight people off with loom parts. 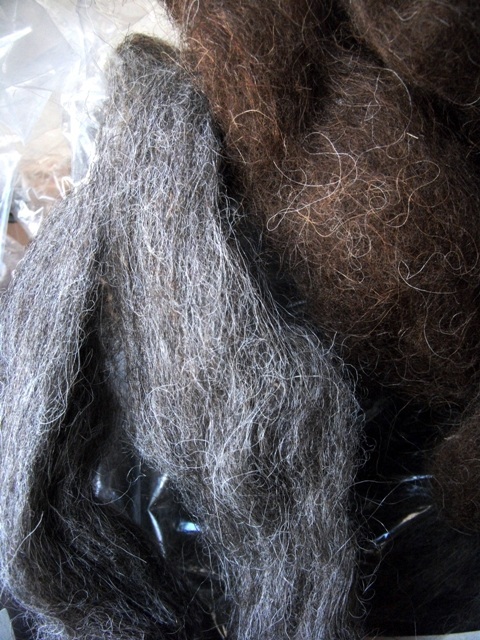 But I suppose it also wouldn’t be the same – the location is what this wool is about. 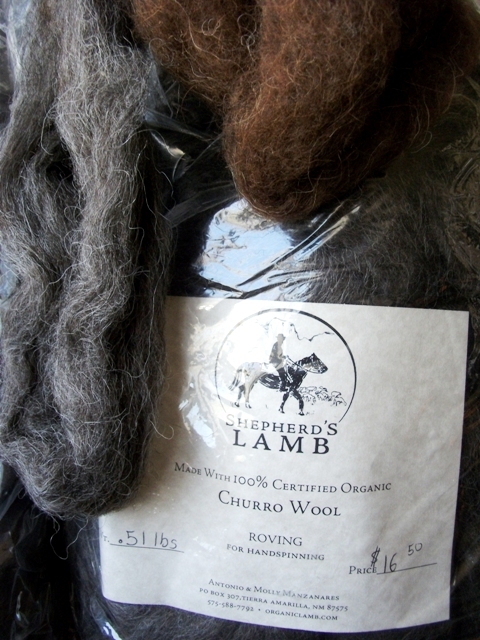 Much of the wool comes from just a few miles away as well as the dyes. The colors in the yarn are reflected in the landscape and the products share the same rugged beauty with the surroundings. Not to mention it offers a source of income in a place where there are few people but I imagine, fewer jobs. 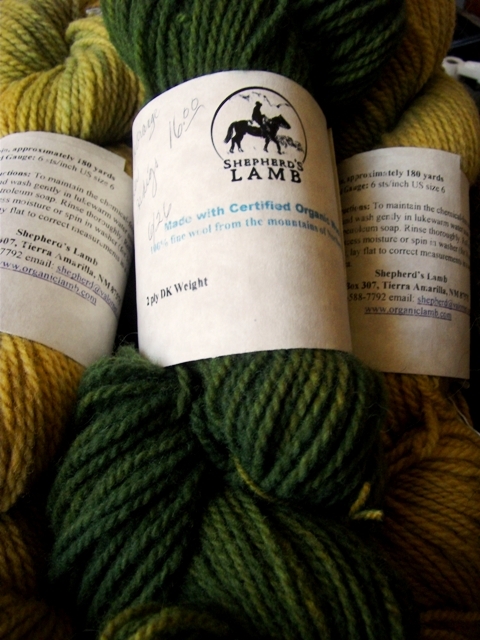 While there, I stocked up on some of the gorgeous Shepherd’s Lamb organic wool products. The wool comes from Antonio & Molly Manzanares from nearby Tierra Amarilla, who also sell their wooly beasts in meat and pelt form. The color range of their yarns and rovings is stunning and some of the yarn lines are dyed with natural dye plants indigenous to the area. On the softer side, I picked out some organic Rambouillet yarn in DK weight. I got two skeins of yellow which was dyed with Indigo over Chamisa, and one skein of green dyed with Osage Orange over Indigo. I love that Osage Orange was used – it was one of my favorite trees growing up and always seemed so out-of-place exotic, nearly tropical, and the fruit is nicknamed “monkey balls.” Who doesn’t love a monkey? Balls! But apparently though the fruit is inedible, it wards off pests so people put them in basements and cupboards. But I digress, I really wanted more yarn and I was out-of-characterly very attracted to some tealy blues and lavenders, but I resisted. I don’t as yet have a plan for this, though I’m leaning toward something shawlette-ish. 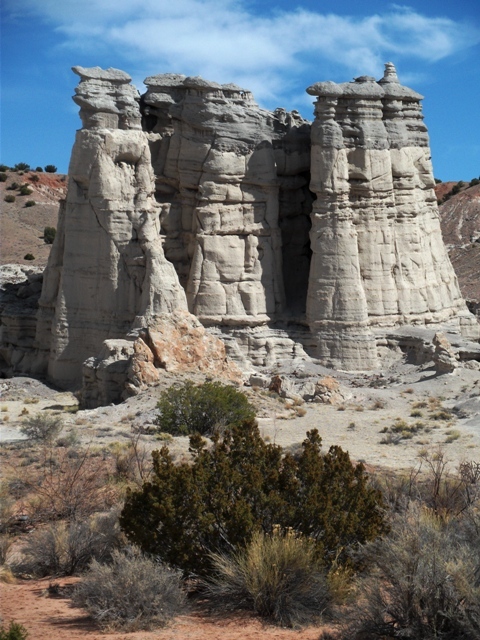 That wasn’t the most flattering shot of Northern New Mexico, though I do love ruins and murky colors, so I’ll leave you with a few more. I love this road – it’s the perfect antidote to the crowded East (except you have to be careful of the occasional elk). This is also fairly close* to Tierra Wools. 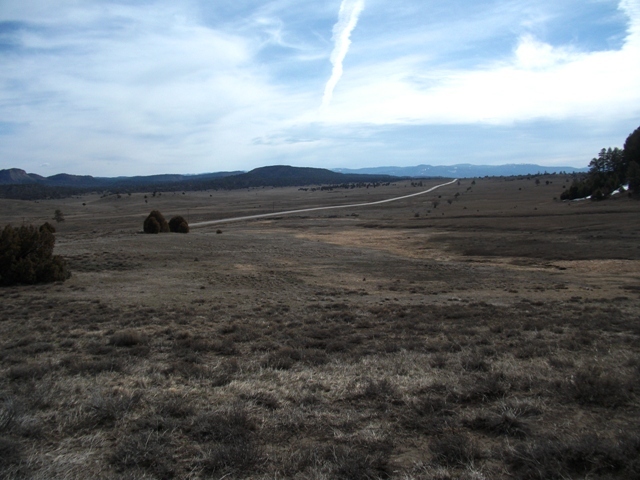 The landscape of the north is more conducive to grazing sheep and other livestock. 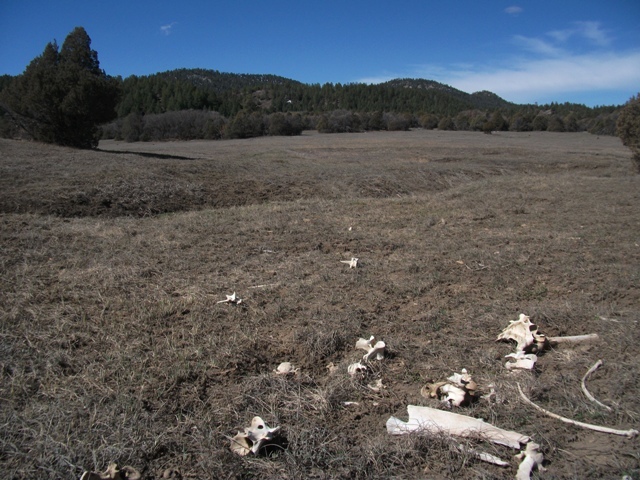 A pile of bones, but not a boney pile. 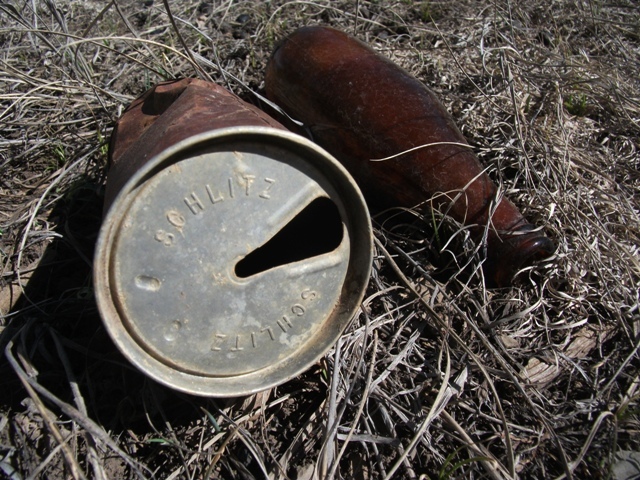 Litter is bad, but vintage litter is cool. Another good day of hiking amongst amazing rocks. 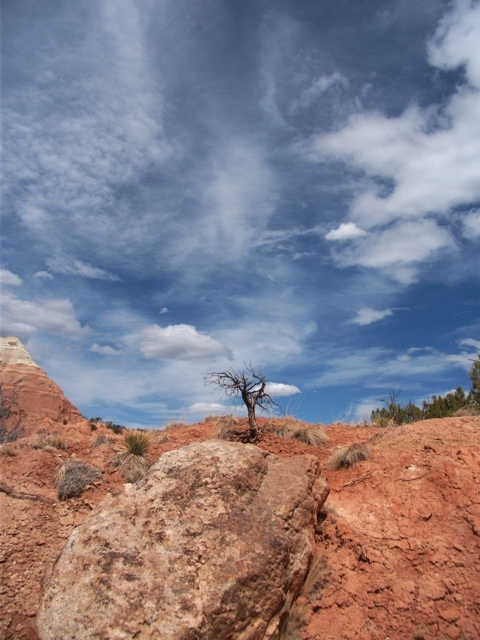 Is it a giant rock, or tiny tree? 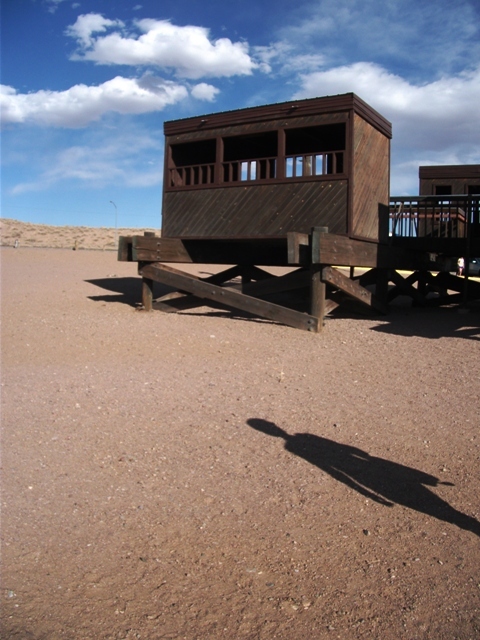 And I love these rest stops with private landscape viewing boxes – you can picnic free of wind and sun while watching dust devils snake below the mesa – just watch out for rattlesnakes. 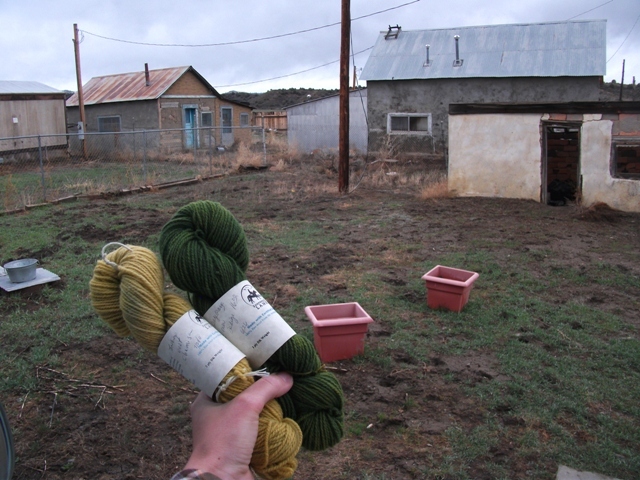 And oh, holy hell, when looking up some of the abundant links in this post, I just found that there is an established “Fiber Arts Trail” in New Mexico, including a route dedicated to the Northern area. I am ashamed to say that though I am somewhat of a professional researcher, I utterly failed in looking up anything about this before I went… Next time, right??? *About 40 minutes away, which might as well be next door out there. Your pictures are great. They’re making me homesick. NM is so awesome. Thank you! And visiting you there was my first time to the state… scary that that was almost 20 years ago!